I was about to tweet the following when the wavy red line made me stop. As you can see, my browser disagreed with my spelling of realisation. Even when I have it set to UK English, I get red lines under a lot of words that I don’t consider misspelled. Not me. I refer to Oxford the Spelling, a style preferred with Oxford the Comma by Oxford the English Dictionary, published in Oxford the City by Oxford the University Press, who also publishes editions of Oxford the Shakespeare which deny the existence of Oxford the Author. That’s me. In a nutshell: when speaking of verbs, OUP calls for -ize endings, while traditional British English favours -ise. OUP’s reasoning has to do with Greek roots, but it’s beside the point here. I confess that I have been inconsistent. I use -ise now, while my old work employed -ize throughout. I made an inventory. 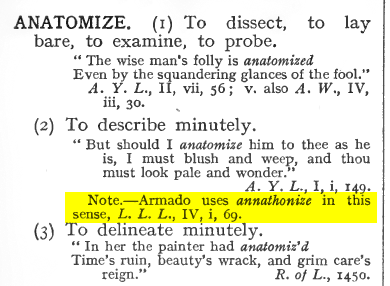 Annathonized. Click the image for the PDF. It’s a simplistic argument, but -ize looks American to me now. This was less of a concern in the 1500s. Most Americans are fine people, but I prefer not to be mistaken for one of them. I have enough issues with my identity as it is. Be that as it may, holding out against Oxford the Behemoth feels like an increasingly futile (not to mention ironic) gesture, so I’m debating opening my -ize again. It returns me in a small way to my past, and nearly everyone is accustomed to it now, no matter which side of the Atlantic is home. Privacy disclaimer: I only see pie-charted results, not IPs nor any other identifying information. This follow-up question is optional, but I’d like to see if nationality is a factor in the above result. This post’s title loses its pun if zed, not zee, ends your alphabet. Ever inconstant, I wanted the play on rhyme. I called my metaphorical garment a sweater, to avoid confusion with non-knitted jumpers. These are differences in vocabulary, not spelling. Babel lies in ruins all around us. [W]e have really everything in common with America nowadays, except, of course, language. I’m posting baubles while I knit a sweater about my journey through Spanish-occupied Flanders in July of 1574. This excursion hasn’t received the attention that my stay in Italy the following year has. It’s easy to see why not. The Flanders trip’s nature and its brevity meant that I left few footprints behind. No doodled signatures for amusing Americans to find centuries later, hidden in dusty buste. Italy’s influence on many of my plays is manifest, yet my experiences in Flanders also informed the work that followed. The circumstances were different and the results less obvious, but the connection is important. I’m in the mood to go into this, but it’s a lot of yarn to untangle, and the sweater may be on the needles for a while. Without spoiling what you’ll see when the knitting is done: Flanders was not a cocked-up spy trip. I was not passing funds to the Catholics. Nor was I skedaddling from my child-wife and her vexatious parents, off to the Low Countries to play at soldiers. That was entirely coincidental. Posted on 3 April 2019 4 April 2019 by @edevere17Posted in Announcements, Authorship (of Shakespeare), Language, Literature/Writing, Personal Stories, Reader Input, Shakespeare, The Two Gentlemen of VeronaTagged Inspiration, OED, Oscar Wilde, Oxford Comma, Oxford Spelling, Oxford University Press, Quotations, Social Media, Survey/Poll, Twitter, United States of America.